Beauty and the Beast. It’s a tale as old as time that has been reimagined by Disney and finally released. I’m sure I can speak for many other fans when I say this was the remake we had all been waiting for… The original wasn’t nominated for a Best Picture Oscar for nothing! Emma Watson as Belle. I think Emma did a great job bringing one of my favourite Disney princesses to life. Belle lives in a town where she doesn’t fit in and is ridiculed for being ‘different’ and wanting more than the life she’s living. She’s then imprisoned in the Beast’s castle without her beloved father who she believes she will never see again. Understandably so, Emma’s Belle is angry at how she’s treated and stands up for herself, fighting against the crap she gets because she’s a woman and I think this is what I appreciated most about Emma’s performance. As for her singing, I wasn’t expecting it to be amazing, but I do think some people are overly harsh as it was absolutely fine in my opinion. It most definitely hasn’t stopped the soundtrack being played on repeat in our house anyway! Dan Stevens as the Beast / Prince. I thought Dan Stevens was so good. He really made the Beast his own character, especially when he started to soften up around Belle. I loved his facial expressions and his saracasm, so sassy! Also, can we just take a second to appreciate him having to dance in stilts?! And we have to mention Evermore, which I think is one of the best Disney songs I’ve heard, and Dan absolutely nailed it. Luke Evans as Gaston. Ah Gaston. The Disney villain we all love to hate. He’s a misogynistic douchebag but he’s also hilarious. Luke Evans was fantastic – he looked and sounded spot on and definitely did the role justice. His rendition of Gaston with Josh Gad (also a fab casting choice) was so much fun, I honestly felt like it deserved a round of applause at the end! Overall, I think the casting was wonderful. Ewan McGregor as Lumière was my favourite out of the castle objects. He was so cheeky and fun and really made the role his own, and I loved his banter with Cogsworth. Also, Stanley Tucci should have been given more screen time! From the first sneak peek we saw all those months ago, I was stunned at how detailed the sets were. Disney sure knows how to create amazing scenery, and did not disappoint in Beauty and the Beast. The castle and village were breathtaking. The attention to detail was wonderful, and my favourite has to be the ballroom as it was just beautiful; it reminded me of the stunning ballroom created for the Cinderella remake. I’ve seen quite a bit of criticism about the Beast’s CGI, but I was more than satisfied with it. His facial expressions were very well done, and I loved that you could really see the emotion in his eyes. I also liked his updated clothing and the iconic blue jacket was just perfect. Ahhhh the showstopper… Be Our Guest was an absolute masterpiece and I can see why it reportedly took 6 months to create. Lumière’s dancing was just the best, and along with the gorgeous colours and animation, it was absolutely spectacular from start to finish and I was so very close to crying happy tears watching it. And here’s where the tears well and truly made their appearance! Truth be told, I was holding back full on tears pretty much from the start as I was just so excited and happy and in awe of everything I was seeing. But my god, when Belle and the Beast started walking down those stairs and Mrs Potts started singing, the tears came. They were definitely tears of joy and overwhelming nostalgia. We have to quickly talk about the dress. It was gorgeous, and I think it suited Emma’s figure so perfectly and she looked every bit the Disney princess in it. It moved beautifully, it was just the right shade of yellow and the gold detailing finished it off perfectly. I loved the little touch of adding the gold from the branches in Belle’s room, it gave the dress that little touch of Disney magic. Although the film is very faithful to Disney’s animated one, there were a few additions to the plot that I felt were really nicely done as they gave more of a backstory than the original. We see the prince before he is cursed; we learn that his father made him cruel following his mother’s death and see how the castle objects feel partly responsible for the curse as they didn’t do anything to stop him behaving the way he did. We also find out that Gaston is seen as a war hero in the village. Finally, the story of how Belle lost her mother is very well done; it’s one of my favourite scenes as I really felt Belle’s sadness when she discovered how her mother died and the understanding of why her father couldn’t tell her the story. I thought Emma was so good in this scene. So as you can probably tell, I absolutely loved this film. I was mesmerised from start to finish; I didn’t stop smiling from the very first scene and I couldn’t take my eyes off the screen. 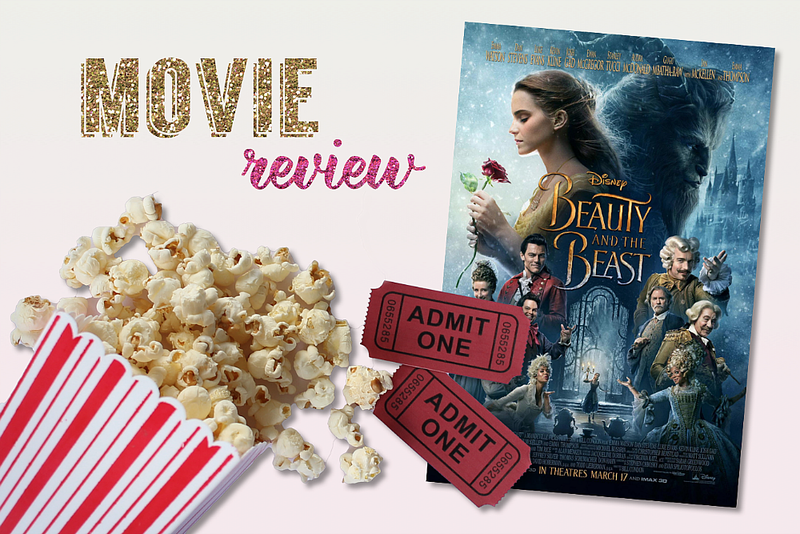 Beauty and the Beast made me laugh, made me cry and even jump in my seat at points and I can honestly say it’s one of my favourite Disney films ever. AMAZING!